News Update: Day Zero pushed back from original date of 12 April to June the 4th! In case you have been living under a rock, Cape Town is currently experiencing a water crisis, dubbed as a national disaster by The National Disaster Management Centre. Current water status: Major dam water capacity is sitting at 25.1% and consumption of water limited to 50 litres a day. 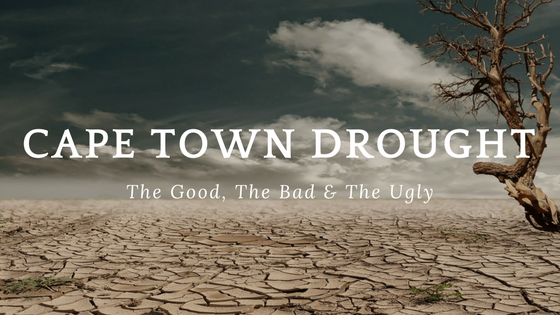 With many theories and speculations floating around the city and people losing sleep about it, we thought we would dive in and scoop out the real shebang about the drought in Cape Town. There is a Light at the end of the tunnel, just as there is good in having a drought. If people shoved the reality of climate change under the rug, well they better get out their shovels and face the true reality that climate change is in fact happening and should be dealt with. The world has taken note of the water crisis in Cape Town, and the topic of climate change is at the forefront of political and economic forums globally. Communities are actively working together, finding innovative solutions to recycle and obtain water as well helping those in rural areas where the access of clean water is already dismal. Government is put into the spotlight; the drought has put their proclaimed competencies and abilities to respond to emergencies to the test. People are asking questions and expecting the Government to respond accordingly. It proves the impossible. If you think you couldn’t live without hundreds of litres of water a day, people are halving their water consumption, proving that it can be achieved and more if need be. People are finding creative ways to use waste water, decreasing the amount put back into the environment. The water crisis has hit Cape Town where it hurts the most, as everyday activities and life are disrupted by the scarcity of this valuable resource. Sport fanatics have taken a real blow, as local sports leagues have been cancelled such as club cricket, school cricket, soccer leagues and swimming. Many school sports festivals have also been cancelled leaving sports people needing to find alternative ways to keep fit and active. Many school toilet facilities have been temporarily closed, school shower facilities are no longer usable, and the use of only one-hand basin in school bathrooms. Learners will have to bring their own bottled water to school every day. Inevitably with the drought comes an increase use of plastic bottles. With people stocking up on water, plastic waste and pollution is sure to sky rocket over the next couple of months, another element contributing to climate change. This is for the wine lovers; 2018 harvest is expected to plunge to a 50% yield. You might get less wine, but at least the quality of the wine will be top notch. People are unhappy and tired of the unkept promises, bad management and planning of the city, province and national government. Promised water purification of Leeuwenhof spring water by Helen Zille, has left people angry and disappointed to find no clean water coming out of the taps. Thus, leading to further protest and outcry by the Water Crisis Coalition. Creating water management systems and implementing plans has caused stirs and internal fights within the cities ruling party. No water, No business. This is the thoughts of many businesses and service related industries as the water crisis slows down every day business. Tourism in Cape Town has plummeted due to the water crisis, a scary thought as tourism brings in up to 40 billion rand into the local economy and assists in job creation.